Everyone has heard the good news about wine. A glass of wine has many benefits, such as potentially helping to lower your cholesterol and sharpening your mind. It’s great to have a bottle of wine or two around for a casual glass with dinner. What about taking that hobby a step further? Have you ever considered adding a wine cellar? It’s a great way to add value to your house and enjoy your wine. 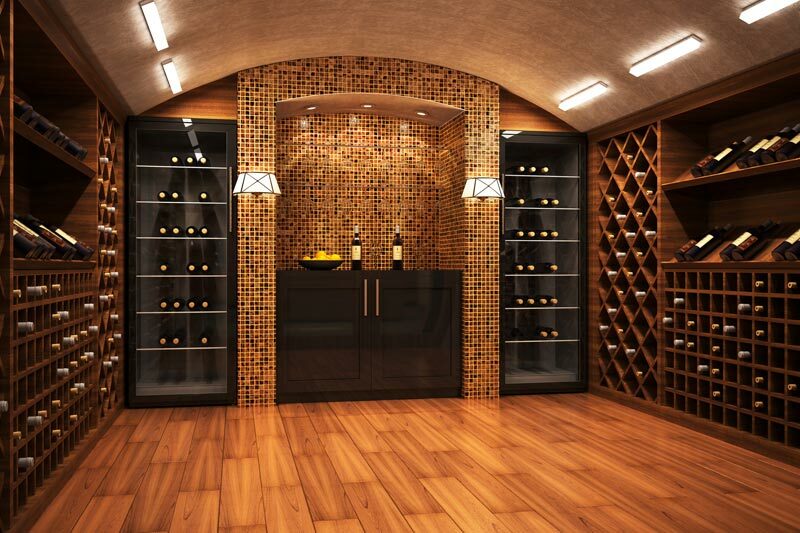 Over 30% of luxury home buyers expressed interest in homes with a wine cellar. If you didn’t plan on it when you first designed your house, we can help to show you how to add it on now. Here are 5 key things you need to know to build this exciting, sophisticated addition to your house. Just like real estate, location is key when putting in a wine cellar. You can add in a wine cellar in a small closet or perhaps under the stairs, but basements are the ideal location. If you already have a basement, then you are halfway there. If not, there are some things to consider before drilling down or looking for a place in your home. Look for these factors when deciding where to place your cellar. Wine cellars demand a lot of maintenance when it comes to temperature control. Insulating the room is key to keeping your wines well-preserved. You’ll want to put together decent framing and insulation with some 2-by-4s and spray foam insulation. Use green board (mold resistant drywall) around the inside of the cellar. You’ll need to put in a cooling system to keep the wines at the right temperature. There are wine cooling systems on the market that can help with not only the temperature but the humidity as well. Don’t forget to plan for an exhaust room for the cooling unit. If your system doesn’t control humidity, you have a few options depending on your budget. A simple humidifier can work, but if you want to splurge, consider adding a water feature to your wine cellar. Have you heard the idea that the words “cellar door” together are among the most beautiful in the English language? Your cellar door should be beautiful – and functional – too. Consider that the cellar door is going to be the first thing your guests see when they visit. It needs to make an impression. Should it be heavy wood? Glass so you can see inside? What matches your decor? Above all, it needs a good seal around it to keep the temperature calibrated. Now that you have got the basics of your space, you can have fun with it. Do you want modern metal racks? Would you rather have classic wood shelving? Will you be entertaining many guests, or will it be a place to store and display your wine collection? Figure out how your wine cellar fits into your lifestyle and go from there. Need a little more help designing the wine room of your dreams? That’s what we’re here for. Contact us and we can begin bringing your vision to life. Michael Helm is a recognized leader in the architectural design and consultation fields. He has more than twenty-four years experience and more than 200 projects to his credit. He has extensive experience with demanding projects and enjoys a high level of success and comfort working with clients, design and construction teams.